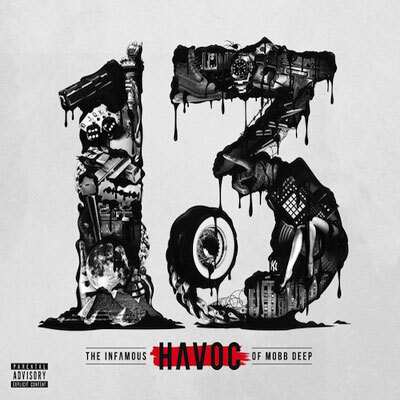 Wayne's Hip Hop Blog : A review of Havoc's "13"
A review of Havoc's "13"
One half of the infamous Mobb Deep, Havoc returns with his 3rd solo album. His solo albums haven't received the attention that his partner Prodigy's albums have, however, he's more known for his dark, tight production than his skills on the mic, which have never been bad in my opinion. So with that being said, let's jump into the review! This apply titled track comes with three thoughts: the beat could've been a little better, Royce kills it, and the overall rating is a 3.5 out of 5. You don't get many outros like this, but it's brief, as Hav mentions what has taken place in his past has made him the person he is today. I've been there also. Wow, I'm honestly a bit surprised at how good this album turned out to be, considering where my expectations were once I was aware of this album's release. Production wise, Havoc hasn't lost a step, as the majority of the beats on this album sound fresh and nothing sounds the same. Lyrically he has stepped things up a notch (not a lot) and you can tell that in most of the deeper songs. The guests, specifically Styles P, Raekwon, Lloyd Banks, and Royce Da 5'9 continue their respectable track record of dope guest appearances. Although things slow down considerably towards the end, I gotta give Havoc props for a very good album, one that I have no problem giving a recommendation, even with the somewhat notable absense of Prodigy. My rating right now is sitting at about 3.5-4 stars.